The information we collect is used to fill orders and to contact buyers if we have questions about your order. Customers may choose to receive occasional emails and promotions. We will never sell, trade, or release your information to third parties. The only time we may share your information is to comply with law as a way of protecting consumers. We use industry standard security techniques to help protect against the loss, misuse or alteration of any information collected from you. Our website uses encryption technology, such as Secure Sockets Layer (SSL), to protect your personal information during data transport. SSL protects information you submit via our website. Be assured that we are dedicated to providing our customers a safe and secure online shopping experience. We accept Visa, MasterCard, American Express, and Discover credit cards. PayPal and Apple Pay are also accepted. Texas residents are required by law to pay sales tax. No sales tax will be applied to orders shipped to any other states. After placing your order, you will receive an email confirmation. Cancellations must be made within 24 hours of ordering by sending an email to care@kidaroocrew.com. Your cancellation will be processed and you will receive an email confirmation within 1 business day. At this time, orders must be placed online from our website. Product safety was our top priority when designing and manufacturing Koala Labels. 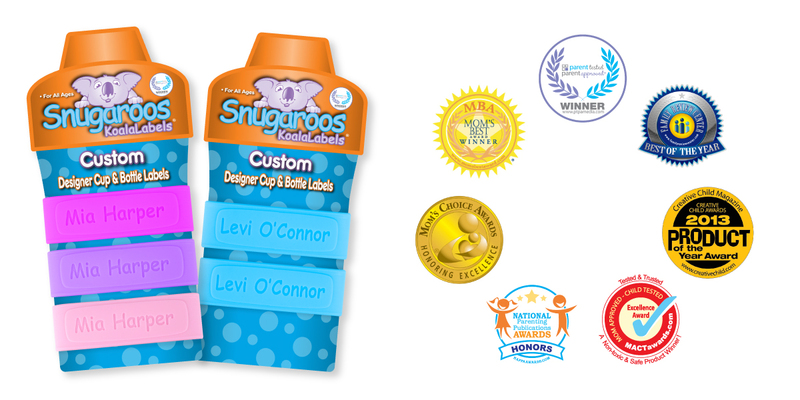 Our pediatrician-recommended personalized labels are made of safe FDA compliant non-toxic material, which is phthalate, lead, and BPA FREE. Koala Labels are CPSIA tested to ensure compliance which enables us to meet and maintain quality, safety, and performance standards. Koala Labels however, are not toys. Adult supervision is recommended during use. Are sippy cups and/or bottles included with my custom label order? Sippy cups and/or bottles are not included, and must be purchased separately. We are currently offering FREE SHIPPING on all domestic orders over $19.99. Applies only to U.S. orders shipping to a single address. The purchase minimum excludes sales tax and promotional discounts. No adjustments will be made to prior orders. We reserve the right to discontinue this offer at any time without notice. We currently ship to all 50 states, Puerto Rico, Guam, Canada, and Australia. Promotional Free Shipping applies only to shipments with U.S. addresses. Shipping fees can be viewed once items are placed in the cart. Yes, we now ship to Canada and Australia. Our flat rate shipping fee to Canada is $10.95. Our flat rate shipping fee to Australia is $14.95. International shipping cost includes tracking information with your shipping confirmation email. Orders of personalized labels are normally processed and shipped within 7 to 10 business days. Expedited RUSH PRIORITY MAIL orders will usually ship within 1 to 2 days. You will receive an email confirmation with tracking information once your package has shipped. Please allow 1 extra business day if your order was placed during a holiday. The U.S. Postal Service (USPS) is utilized for standard First Class shipping and Priority Mail. Estimated shipping times at checkout are not guaranteed and do not include processing time. Packages that are returned due to incorrect addresses provided by the customer are subject to an additional shipping fee. We are confident in the designed durability of our personalized labels, and want you to be completely satisfied with your purchase. If one of your custom labels should tear or break within 90 days of purchase, please contact us for replacement. Your custom labels are not eligible for replacement after 90 days from the date of purchase. Please note that custom engraved labels cannot be resold, therefore all sales are final and not refundable unless we make an error during the personalization process. Please check that you have correctly spelled/typed the desired personalization before submitting your order, as this information is used to manufacture your custom labels. Our goal is to provide a great shopping experience for our customers through the unique high quality personalized labels we offer, a user friendly website, and exceptional customer service. Our custom labels are innovative and practical, but also the highest quality. We appreciate and encourage your feedback. Our hope is that the ability to easily interact with us about our products, our website, and our customer service will help to keep our products and services relevant and our customers happy.